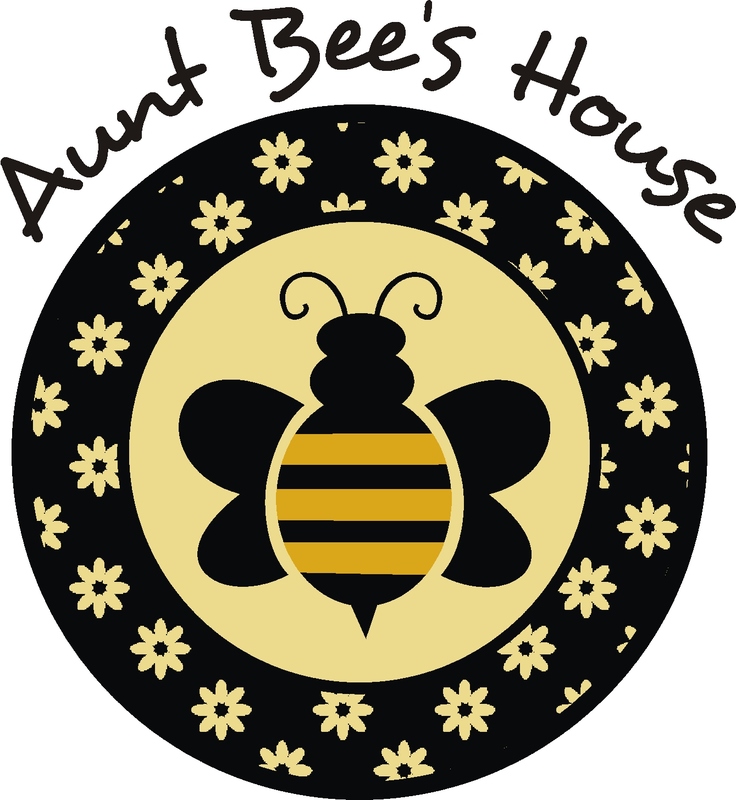 Thank you so much for all of the nice comments yesterday on our front porch! It was so much fun putting it together, and I'm glad that some of the projects I featured inspired you. I thought I would offer the tutorial on how I made the slipcovers for the pillows- so here we go. For those of you hoping for a no sew project, I did sew these, but it's just 4 straight stitches, so hopefully if you have access to a machine you can do it too! First, you need button down shirts. 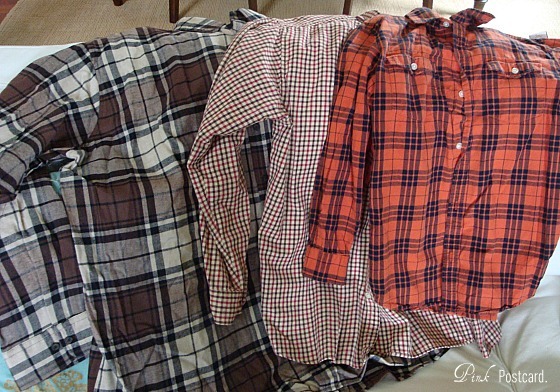 You don't have to use flannel, I just did for the season. Look for sizes Large or Extra Large if you are working with an 18" pillow. 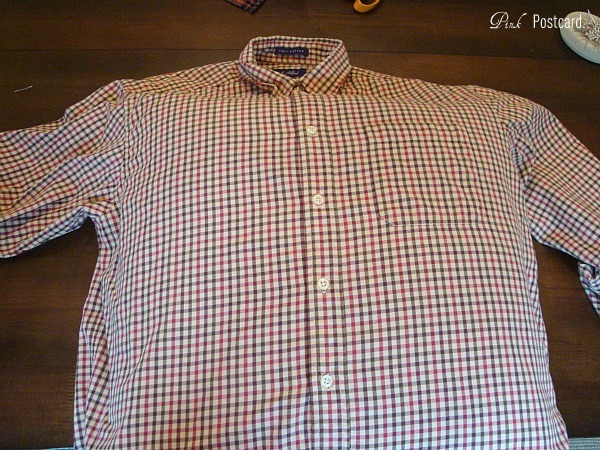 After a quick wash and dry, make sure the shirts are completely buttoned up, and slip the pillow into the middle of the shirt. 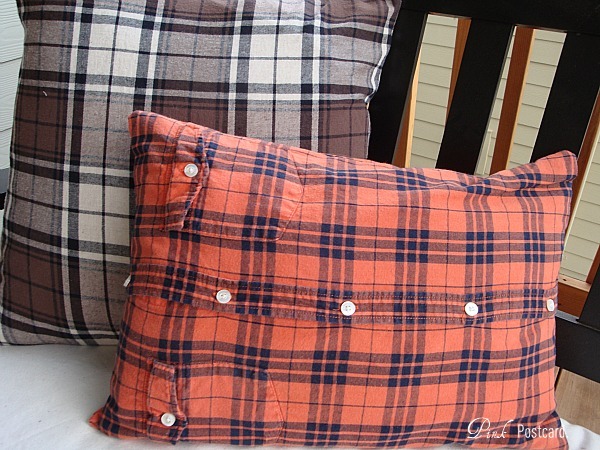 Next, cut the sleeves off- it makes it easier to work on the pillow without them flopping around. 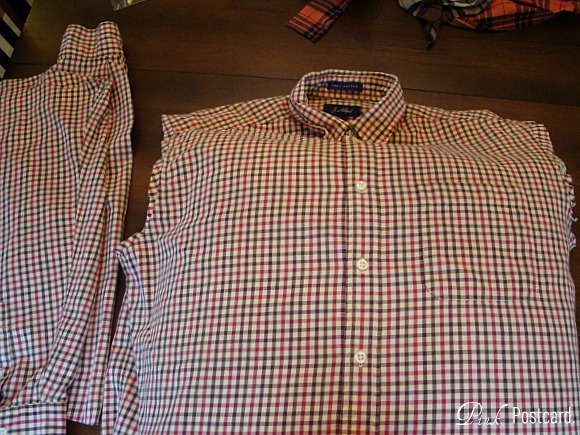 After you've made sure your pillow is centered under the shirt (buttons going down the middle of the pillow and enough fabric on the sides to start cutting away), pinch the sides of the pillow so you can start cutting out the main pieces. 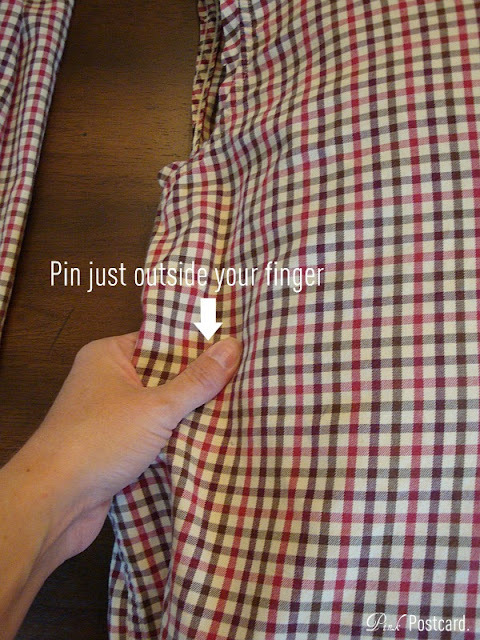 You want to cut to the outside of where your finger is pinching, on a line, so that you have enough allowance to stitch and not have your fabric too tight. 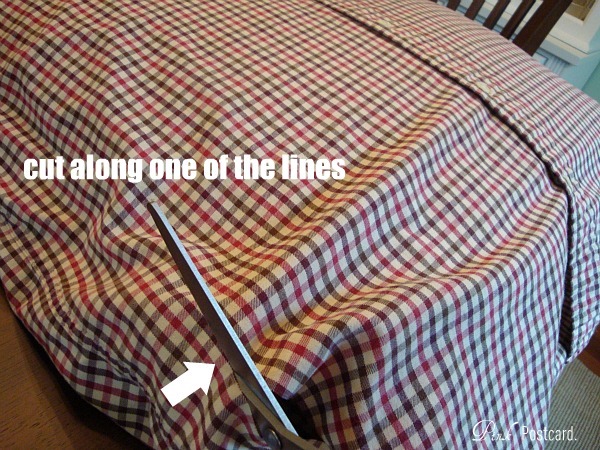 You can pin it and cut, or just follow the line to the edge and cut away. Then, you put your button side to the inside of your fabric squares and pin all around the edges so you can sew them together. 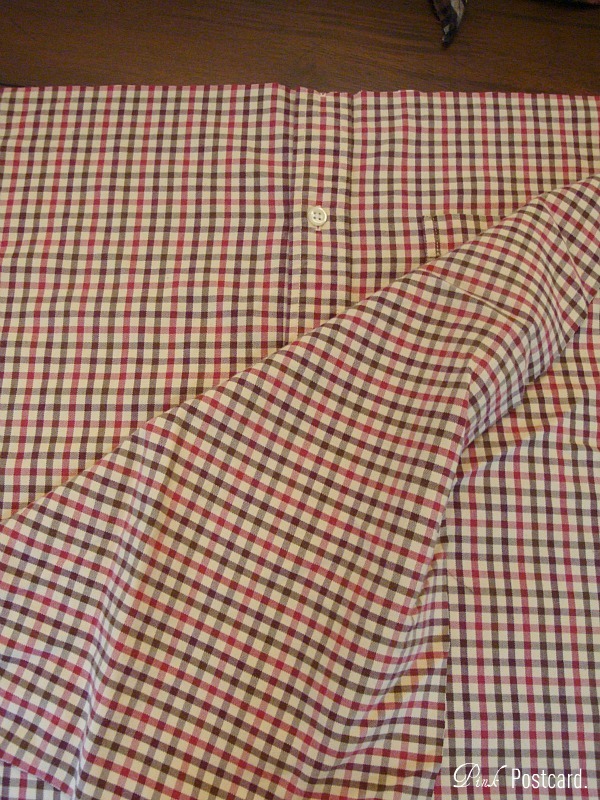 Once you have all four sides sewn, you can unbutton the shirt, turn it right side out and slip over the pillow! The orange pillow you see above was actually a boy's Large shirt- so you can also use that size if you are using a pillow form that is smaller than an 18" square. I hope you found this helpful! If you have any questions, I'll try and answer in the comments so others can see if they have similar inquiries. Love your pillows and your blog. New follower! Good tutorial. Now to find a shirt and a pillow form. Denise that is such a great idea! They look so cute! I love quick and easy! They look wonderful. Nice creativity, t-shirt style.I like it a lot.This is really great idea.Thanks for sharing it.